Q: What am I? I’m breakfast…with benefits! Hint: I’m quick, easy, super-nutritious & freakin delicious. I’m portable. I’m vegan-friendly. I’m gluten free / dairy free / refined sugar-free & low FODMAP. I’m high in good fats, plant protein & diverse fibre. I’m gonna give you a ‘good gut feeling’ all day long. A: I’m the ultimate gut-healthy breakkie combo! Blend11 teamed with Pure n Free Coconut Yoghurt! We’re all time-poor (& maybe a teeny bit lazy) & we don’t have the time or inclination to research what’s good for us & what’s not (that’s our job). Nobody has time to run around shopping for top-quality individual ingredients (our job as well) & there’s definitely no time in the morning to design complex nutritional breakfast masterpieces that tick all of the right boxes. Good news = we did it already!! Well we did the hard bits, you can just do the fun bits like adding some fruit! Starting your day with a Pre & Pro Combo means no nasty gut aggravators for breakfast = bye-bye to annoying bloating, poo problems, brain fog, cravings & energy slumps! Hello to feeling comfortable, alert & relaxed throughout the day with a happy & functional gut. 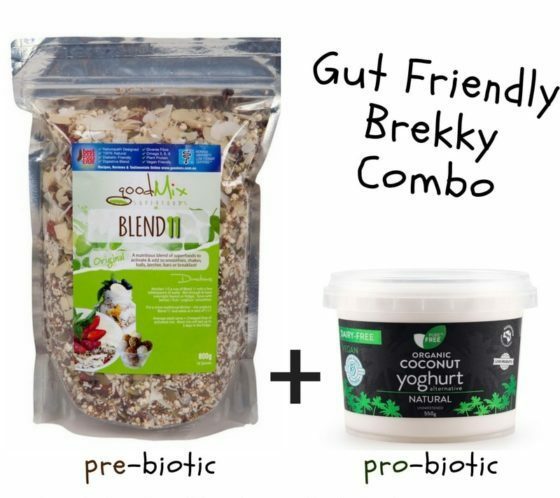 The Pre & Pro combo is perfect for anyone who feels & functions better eating breakfast a little later in the day. 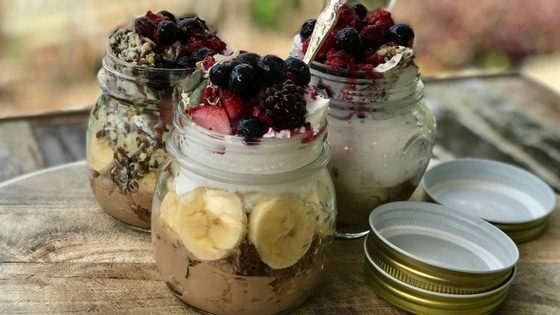 Breakfast jars can be made in advance & stored in the fridge ready to ‘grab & go’ on the way out the door. Just store in an insulated lunch box or wrap a stubbie cooler around the jar to keep it nice & cool until hunger hits. Ideal to give our overworked guts some good long sleep-ins, & train the body to burn up any leftover energy stores (fat)! The first thing to hit your belly every morning should be some gut-love! Prebiotic fibre plus probiotic yoghurt = yummy for the tummy. 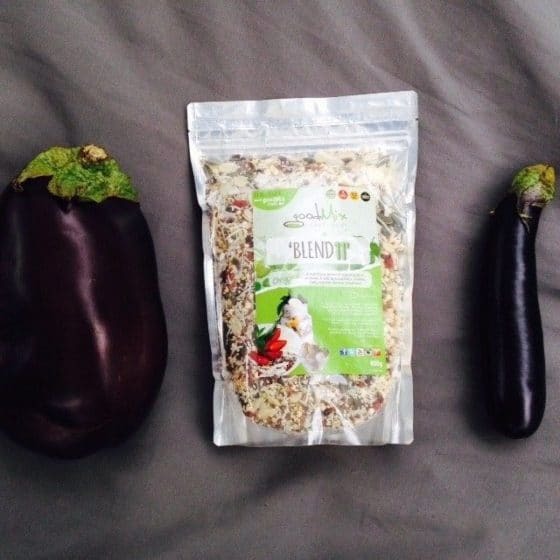 “Get in my belly, & let the pre & pro party begin!” Diverse prebiotic fibre that is also Low FODMAP means plenty of good tucker for the good tummy bugs to munch on, so they can get a head start on the bad guys for the day, plus a heap of probiotic reinforcements to support your own army! This kind of breakfast is setting the stage for ‘a good gut feeling’ throughout the day! No animals involved = happy days for everyone. The more easy, yummy & nutritious vegan options we all have in our fridges / pantries the better. Even if you’re not vegan all the time, you can easily eat vegan at breakfast time. So many of the easy breakfast options are waaay too carb & sugar heavy. Add more fat, fibre & protein & energy levels will be much more stable, cravings will decrease, moods will be better (that’s just short term). In the long term we can see better gut function, better metabolism & body composition, better skin, better immunity, better brain function, decreased systemic inflammation…high-fat fibre & protein to start the day beats a bowl full of carbs hands down. Too many numbers in your day = your days are numbered. Food with numbers & weird scientific names & added this that & the other is best avoided at any time of the day, but especially breakfast time (at least get the first meal right!) Go for unrefined, real food that will ‘go off’. Anything with an unnaturally long shelf life will shorten yours. Look for food that’s alive, & close to how nature made it. 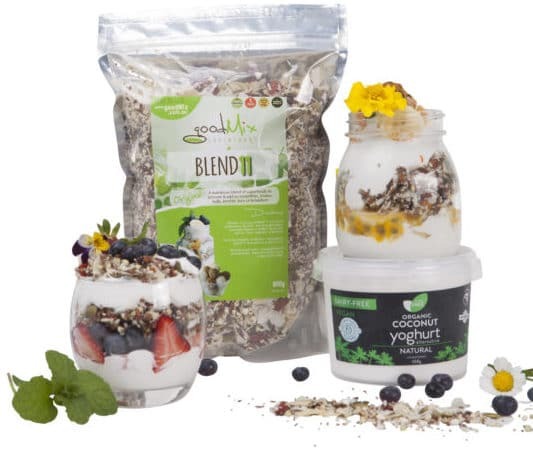 Activated enzyme-rich organic seeds plus organic natural coconut yoghurt with living probiotics = winning combo. Top it off with some delicious fruit & you have a bowl full of vitality to start the day. Not in the mood to chew? No clean bowls in the house? Smoothie it! 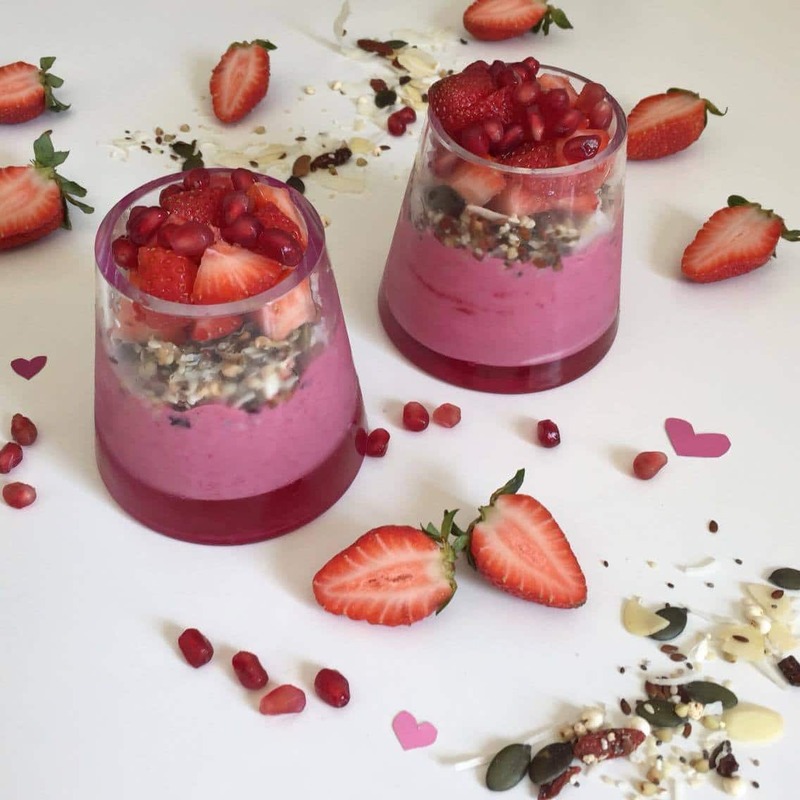 So many possibilities – berry, banana, cacao, acai, green, coffee, vanilla….so many flavour options, & coconut yoghurt with activated seeds are equally at home in a glass or a bowl. 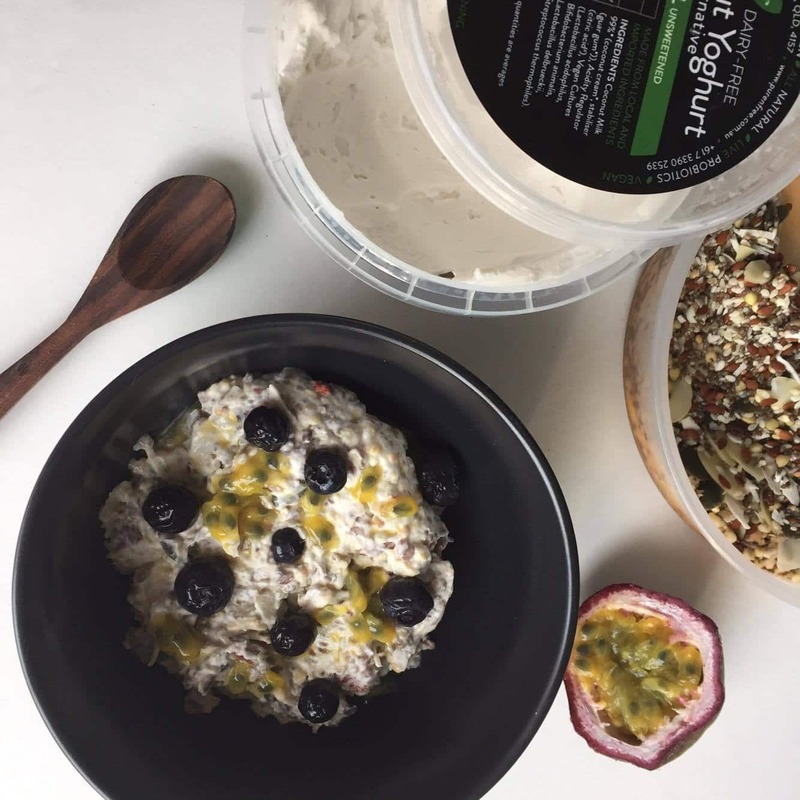 This entry was posted in Gut Health and tagged biotic, blend11, coconut yoghurt, gluten free, gut health, Healthy Breakfast, low FODMAP., prebiotic, probiotic.